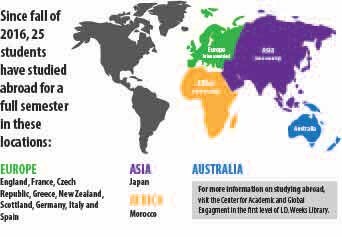 USD students have the opportunity to gain unique experiences studying abroad with the help of detailed planning set up by the Center for Academic and Global Engagement (CAGE). The pre-departure process for studying abroad set students up for academic, professional and individual growth on their excursions. Virginija Wilcox, study abroad assistant director, helps prepare students by hosting pre-departure orientations on health, safety and education on the social construct and culture of the countries students plan to visit. “Everyone will experience culture shock on some level, but going through it makes you stronger and open up more because it enables you to start seeing things from different perspectives,” Wilcox said. Although experiencing culture shock is common among students studying abroad, the pre-departure process equips students with resources to ease the transition. Wilcox said identifying goals and mapping out an academic program are two important priorities students should consider before deciding to study abroad. Mark Maxon, CAGE director, said he stresses the importance of academic success in the study abroad program. Maxon said he aims to help students achieve their goals with life-changing experiences. If a student is interested in pursuing a master’s degree in a subject USD doesn’t offer, studying abroad can serve as a way of getting experience to find out if that field is right for them, Wilcox said. Maxon said there is an abundant amount of scholarships available for students looking to study abroad. After attending a study abroad fair, Taylor Bergeson, a senior psychology and social work double major, said she decided to study abroad in Ormskirk, England at Edge Hill University last fall. Bergeson said there is a six-hour training session that provides valuable information about what to bring on a trip as well as information about the cultural background of the country. CAGE also offers an optional training process that helps students transition when they return home after their trips, which Bergeson said was extremely helpful. “You go through highs and lows when you first arrive to the country you’re going to, but you experience the same highs and lows when you get back home as well,” Bergeson said. Although Bergeson said she wanted to travel to parts of Europe, studying abroad was much more than exploring a new country. “I was able to further my education with international students that I formed life-long friendships with as I studied abroad,” Bergeson said.